Lula Ruth Patrick, age 89 of North Branch passed away on Thursday, August 2, 2018 at McLaren Lapeer Hospital. Lula was born October 23, 1928 in Sebewaing, Michigan. She was the daughter of Melvin and Ethel (Lennox) Diller. After meeting on Friday the 13th (February 13, 1948), Lula married the love of her life, Clare Francis Patrick on May 19, 1949 at the Deerfield Church of Christ. Lula had a heart full of love that overflowed to those around her. Lula worked hard all her life alongside Clare on the farm. She always wanted to be near Clare as they journeyed together. 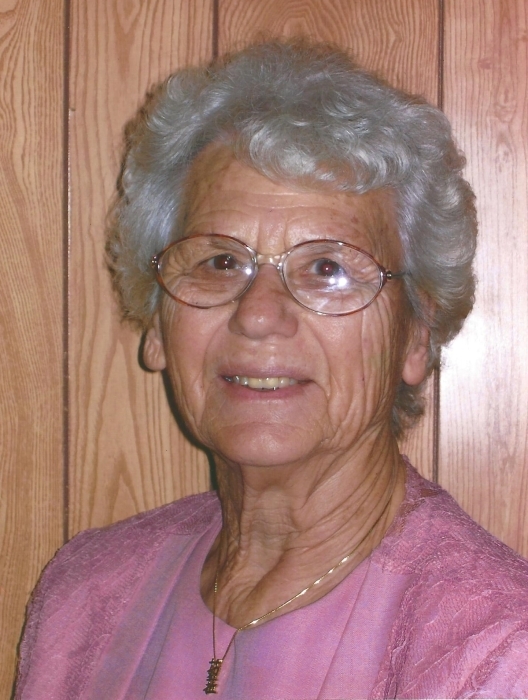 Lula was a strong and committed Christian and could quote a Bible verse for most occasions. Her desire was to be reunited with those she loved in Heaven someday. Lula loved attending family reunions. She embroidered beautiful pillowcases, scarves, and other items. Lula made the best pies, especially Clare’s favorite, apple pie. She would have a large garden every year, and canned her own fruits and vegetables. Lula is survived by her loving husband, Clare; her children: Melvin Patrick, Wesley (Paula) Patrick, Ruth (Robert) Clark, and Doris Patrick (Gary Green); her grandchildren: Lesley (Gary) Haxer, Kristen (Bob) Daniels, Heather Patrick, Hillary (Brett) Lane, Rachel (Brad) Dillon, Joshua Clark (Sylvia Romo),and Sean Patrick; her great-grandchildren: Nate, Ben, Lizzy, and Zach Dillon; Emiliana and Lorenzo Clark-Romo; Caylin and Meegan Daniels; and McKenna and Sterling Lane. Her grandchildren and great-grandchildren were the pride and great joy of her life. She is also survived by Louise Pasternak (sister); Vera Fife (sister-in-law, but sister in her heart); Brenda Patrick (daughter-in-law). There are many nieces, nephews, sisters-in-law, brothers-in-law (on both the Diller and Patrick sides of the family), and friends she loved very much. She was preceded in death by her parents, Sally Passingham (sister), George Diller (brother), and Scott Patrick (grandson). Visitation will be Thursday, August 9, 2018 from 2 to 4 pm and 6 to 8 pm. On Friday, August 10, 2018 there will be visitation 10 to 11 am with the Funeral Service to follow at 11:00 am all at Blackburn Chapel-Martin Funeral Home. Rev. James Roberts will officiate. She will be buried at West Deerfield Cemetery. In lieu of flowers, please make donations to the Children’s Cancer Research Fund in Lula’s memory.